I went ahead and grabbed one of the other 193s to finish up the Data Pointer at the top-left. The output of the counters are connected in purple to the address lines of the Data RAM. The buttons on the left are connected to Load (orange), Clear (white), Down (red/blue) and Up (green/yellow). This allows me to easily cycle through memory addresses. Load, Down, & Up are active low, so they've got pull-up resistors to +5V. Clear is pulled low. The I/O pins of the RAM are connected to the data bus. 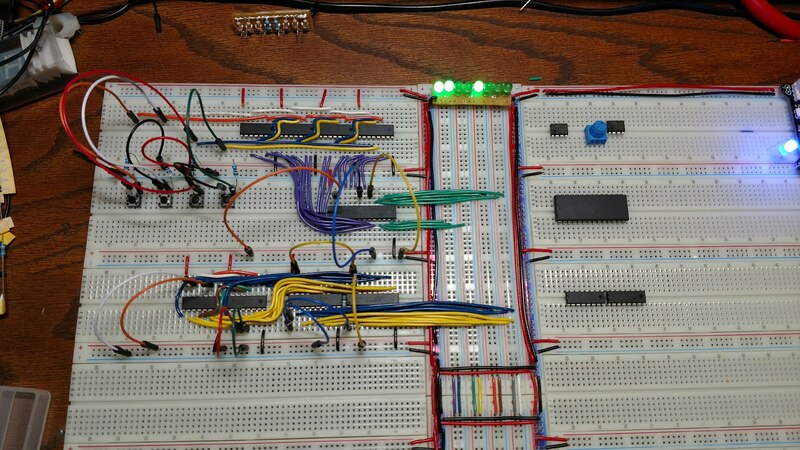 The three jumper wires coming out of the ram are Load (orange), Output Enable (blue), and Chip Enable (yellow). These are all active low, so currently it's sending whatever value is being pointed to in RAM onto the bus. The LEDs show this as 11001000 (0xC8). The Data Register has grown quite a bit more complicated. The chips with wires going to the bus are 74LS244 octal tri-state buffers. These separately connect/disconnect the inputs (blue) and outputs (yellow) of the counters to/from the data bus. If I were using CMOS chips, I would leave the inputs connected and only switch the outputs. But with TTL, inputs draw non-trivial current and I don't want to load the bus any more than necessary; breadboards already have a hard enough time delivering power. The 193s have the same jumper wire colors for clear, load, down, and up as the data pointer but are connected directly to the power rails rather than through buttons. At this point I'm more concerned with moving data between RAM and the register. I can do that in this shot by moving the blue jumper to ground on the data register (input from bus), then momentarily bringing the orange jumper to ground (load). Once the value is loaded into the register it can be modified with the up/down jumpers (albeit with tons of bounce). Then I can load it back into RAM by turning off the output from RAM (set its blue jumper high), enabling output from the data register (set its yellow pin low), and momentarily set the RAM's load pin low. Next post will demonstrate some of this in action.